The U.S. Navy and U.S. Naval Sea Cadet Corps both recognize the need to encourage volunteer activity by its members to benefit their communities. To this purpose, both have created ribbon awards to recognize such activity. The command of the Escondido Battalion and Training Ship Kit Carson strongly encourage all Cadets and Leaguers to earn the NSCC Community Service Ribbon, which requires 30 hours of service from Sea Cadets or 20 hours of service from League Cadets. policy that all members shall be required to accumulate community service hours per these procedures prior to each advancement in rank. Community service performed as part of a required unit activity such as a drill, bivouac, or advanced training may NOT be used to satisfy this requirement. Sorting and packing at Operation Support Our Troops, or participating in fundraising efforts on their behalf. Participating in fundraising activities for other organizations such as the American Legion, Veterans of Foreign Wars, American Red Cross, United Way, etc. as approved by the Commanding Officer. Volunteer services at a public library or museum, including such programs as Reading Buddies, etc. Visiting residents of retirement centers who are NOT related to the member, especially veterans. Roadside, park, waterway, and other public property clean-up efforts. Other activities as approved by the Commanding Officer who shall have full and final authority to determine the acceptability of any hours earned. 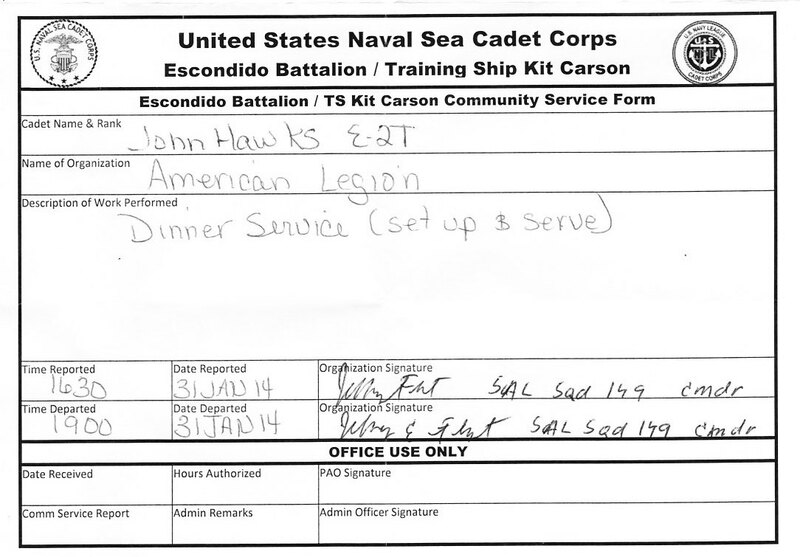 When performing community service, cadets shall take the Escondido Battalion Community Service Form, available at the link at the bottom of this page. On this form, the cadet will record their name and rank, the date, the name of the organization served, and the nature of the work performed. They shall have an organization representative record and sign for the time they arrive and for the time they depart. The form shall be turned in by the cadet to the Administrative Officer, who shall calculate the hours to be credited and endorse the form prior to passing it on to the Awards Officer, who will track the hours each member has accumulated at each rank toward the Community Service Ribbon. The Administrative Officer shall make the appropriate notation in the cadet’s Service Jacket. If a number of cadets, supervised by an Officer in Charge (OIC) performs the same community service at the same time, the OIC, in lieu of individual forms, shall prepare a memo or e-mail message describing the service, the number of hours, and the members present, which shall then be treated in the manner above. Hours required for each advancement as listed below may NOT be banked, i.e., the required minimum hours must be performed at each rank. For example, if you perform 6 hours of community service as an E-1, you will still be required to perform at least 3 hours as an E-2 for advancement to E-3. a. For advancement to E-2, the cadet will perform at least 3 hours of community service as an E-1. b. For advancement to E-3, the cadet will perform at least 3 hours of community service as an E-2. c. For advancement to E-4, the cadet will perform at least 3 hours of community service as an E-3. d. For advancement to E-5, the cadet will perform at least 6 hours of community service as an E-4. e. For advancement to E-6, the cadet will perform at least 6 hours of community service as an E-5. f. For advancement to E-7, the cadet will perform at least 9 hours of community service as an E-6. a. For advancement to LC-2, the cadet will perform at least 3 hours of community service as an LC-1. b. For advancement to LC-3, the cadet will perform at least 3 hours of community service as an LC-2. c. For advancement to LC-4, the cadet will perform at least 3 hours of community service as an LC-3. d. For advancement to LC-5, the cadet will perform at least 3 hours of community service as an LC-4. e. For advancement to LC-6, the cadet will perform at least 3 hours of community service as an LC-5. f. For advancement to LC-7, the cadet will perform at least 5 hours of community service as an LC-6. When a cadet has completed the time in grade, coursework, and advanced training requirements for advancement, the Commanding Officer will consult with the Awards Officer to ensure the cadet has completed their community service requirement. If they have not, the advancement will be held until the requirement is met. When a cadet has completed 30 hours of Community Service (or 20 if a League Cadet), the Awards Officers will advise the Commanding Officer and arrange for the member to be awarded a certificate and ribbon (or bronze star) at the next opportunity.